Naturally Bespoke Cakes > Blog > Naturally Colourful > Winter is here and it’s raining sprinkles…. Wow, what a lot of rain we had during May. The sun has finally come back now and I’m loving it, only thing is it’s brought with it some pretty chilly temperatures. Mother nature is definitely letting us know that winter has started! 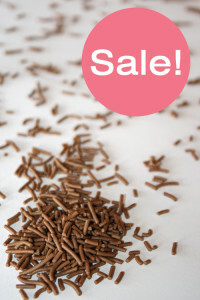 To celebrate this changing of the seasons we are having a sale on our sprinkles and with every order during the month of June you will receive a free refill bag of our tasty Chocolate Sprinkles. Our Chocolate Sprinkles are so tasty that my five year old decided we had to bake cupcakes this weekend, and they had to be decorated with chocolate sprinkles. She chose a yummy vanilla cupcake and we added a small dollop of cream cheese icing and a dusting of sprinkles to top them off. Delish!! I thought you might like to try them yourself, so here is the recipe. Preheat oven to 170 degrees fan-forced and line cupcake tins with cases. This recipe make approx. 16 cupcakes. Beat the butter and sugar until light and creamy. Add eggs one at a time followed by vanilla extract. Sift the flour, cornflour and salt and add to the mixture, alternating with the milk. 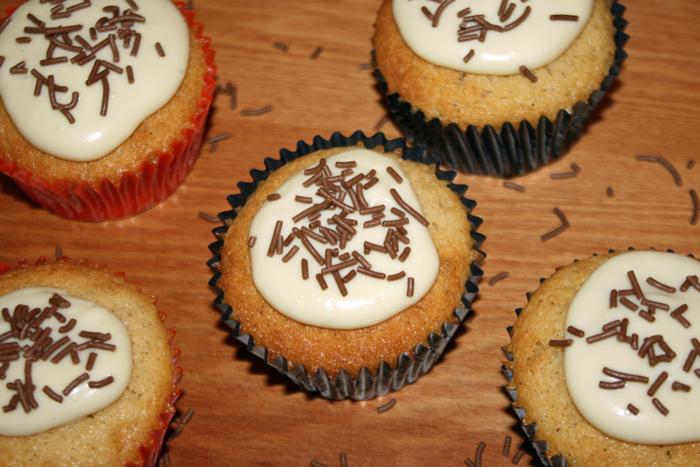 Spoon the mixture into cupcake cases and bake for 10 – 15 minutes or until cooked. Once cooled ice with your favourite icing and decorate with Naturally Colourful Sprinkles.